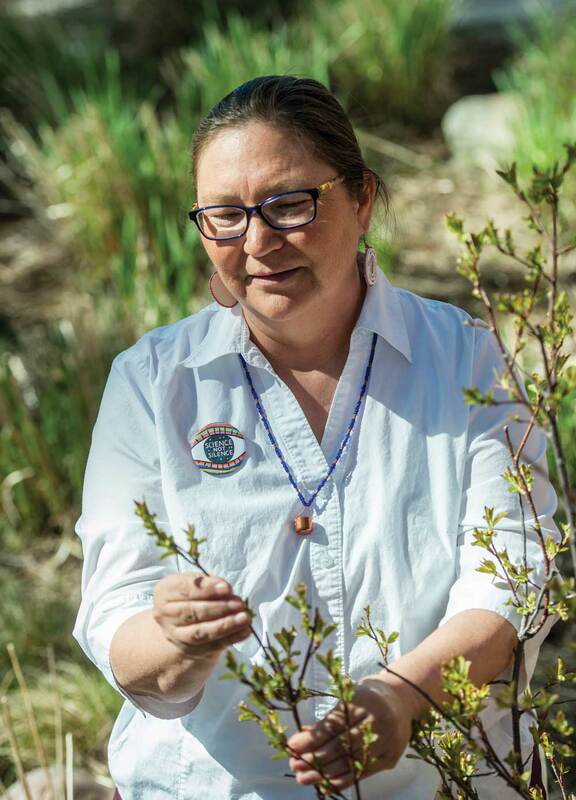 Ethnobotanist Rosalyn LaPier examines the spring buds on a chokecherry bush in the Blackfeet tribal section of the Native American gardens that surround UM’s Payne Family Native American Center. When Rosalyn LaPier was a girl living on the Blackfeet Reservation in Browning, her family would travel to Great Falls to do their grocery shopping. Their route always took them through backcountry roads. And for LaPier, that meant sitting through a meandering drive as her grandmother told stories about the landscape along the way. LaPier later learned that her grandmother’s storytelling process wasn’t just idle conversation. It was a means by which vital knowledge – including indigenous science – was passed down to subsequent generations. Those stories were, and still are, inextricably linked to Blackfeet religious beliefs about the natural landscape. TEK was first defined by Manitoba-based professor Fikret Berkes in his 1999 book “Sacred Ecology” as involving three tenets: knowledge (information passed down through generations), practice (how people use that knowledge to support their livelihood) and belief (the religious or worldview of a culture through which they understand knowledge and practice). LaPier learned about science from her great aunts and her grandmother, Annie Mad Plume-Wall, a Blackfeet scientist and doctor. Mad Plume-Wall had in-depth knowledge of plants, including lichen and fungi. She understood weather patterns. And she had learned this knowledge from her grandmother and great-grandmother. LaPier talks about how her grandmother taught her how to “hold soil in her hand and breathe in deeply to gauge how much tannin was in the roots of a medicinal plant.” As she grew older, Mad Plume-Wall encouraged LaPier to write down the stories and knowledge she had taught her about medicinal plant use. Her grandmother knew that with future generations, Blackfeet knowledge and the voices of indigenous science would be passed down through the written word and in English. LaPier has taken her grandmother’s directive to serious lengths. An enrolled member of the Blackfeet Tribe of Montana and Métis, her written work, academic teaching and activism provide a dimension to the national science community that has long been ignored. She has worked to elevate an essential viewpoint in a country that often dismisses ideas outside western research and practice. And in the past couple years, she’s received a lot of recognition for that. 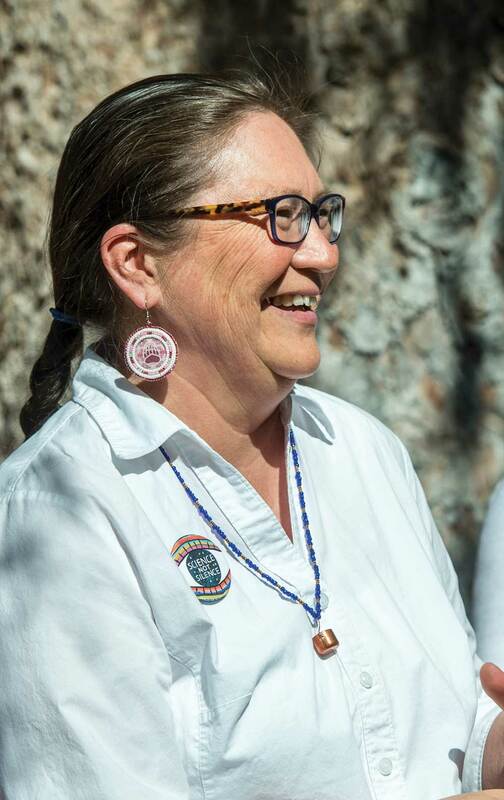 LaPier is the first and only enrolled Blackfeet tribal member with a tenure-track position at UM, and in early February it was announced that she had received the George M. Dennison Presidential Faculty Award for Distinguished Accomplishment. She is only Native American to receive the award. As chair of the national board for the March for Science, she’s also a driving force in the national conversation about science and activism. LaPier considers the academy her second career. Before coming to UM six years ago, she spent 10 years teaching at a community-based tribal college, Native American Educational Services College, and 15 years at the Piegan Institute, a nonprofit chartered in 1987 to research and preserve Native American languages. It was the elders in her community who encouraged LaPier to go back to school and get her Ph.D., and she came to UM to study environmental history. Since starting work as a professor at UM in 2012, she’s continued to build on the projects she was working on in the nonprofit world. Her writing has appeared in The Washington Post, High Country News, Newsweek and Indianz.com, among others, and her first book, “City Indian: Native American Activism in Chicago, 1893-1934,” written with UM Professor of Native American Studies David R.M. Beck, won the 2016 Robert G. Athearn Book Award for best book on the history of the 20th century American West. In “City Indian,” LaPier and Beck explore what kind of Native activism existed during the time period when conservationists and preservationists were reforming policy. Last year, LaPier published “Invisible Reality: Storytellers, Storytakers and the Supernatural World of the Blackfeet,” a book that closely examines the third tenet of TEK: religious beliefs. It’s composed of family vignettes and history, with an emphasis on how Blackfeet supernatural beliefs interact with the culture’s history and relationship to the natural world. Her overarching question for the book was, as Blackfeet moved onto their reservation and their landscape began to shrink, how did they adapt? And the answer she found helped bring into focus the ways in which belief systems are inextricably linked to environmental history. The book also provides key examples of how the supernatural cannot be separated from indigenous science. In one section, LaPier offers a few tales of Morning Star — a being of the Sky world — and his Star Child. The stories in which the supernatural interacts with the human realm, play out in practical and scientific ways for Blackfeet culture. The Star Child becomes the North Star, by which the Blackfeet navigated the Great Plains, told time and calculated the seasons. The North Star’s earthly counterpart, the prairie puff ball, provides medicine and tinder. But, then again, all science is filtered through some kind of worldview. LaPier argues that western scientists working in the United States have a distinct American lens through which they view their work. This lens is not often acknowledged in the science field, and remains a blind spot when it comes to western science definitions of nature or approaches to environmental conservation and restoration. That concept is especially pronounced in the country’s definition of national parks. They are often seen as places separate from humans when, in fact, national parks were created by driving humans out of them. LaPier’s current project focuses on purification practices in Blackfeet culture. She started that work before she came to UM, when she was at the Piegan Institute working with elders whose knowledge of plants used for smudging was vast. The elders were concerned that young Blackfeet members were only familiar with a few of the most common plants: sweetgrass, sage and sweet pine. Through interviews with elders and natural history research, LaPier began compiling a list of all the plants used for purification such as the inner bark and sap of a cottonwood tree. In 2016, LaPier was awarded a fellowship at Harvard Divinity School as a visiting assistant professor of women’s studies, environmental studies and Native American religion. She spent her time at the Peabody Museum of Archaeology and Ethnology and in the stacks at Divinity School’s huge library. She compiled a list of more than 30 plants used by Blackfeet, plus eight natural elements, including water, also used for purification practices. She studied the plants' ecosystems and explored the concept of purification in terms of religion and gender. Her third book, based on that research, “Plants That Purify: The Natural and Supernatural History of Smudging,” will explore the worldview of the Blackfeet and what their ideas of purity are, and it also will compare those concepts to similar purity beliefs in other religions, such as Catholicism. In 2017, after the nationwide Women’s March, LaPier got involved in a discussion on social media about how scientists needed a similar march. Within a few days a group had mobilized, and LaPier joined a nine-person steering committee to set the idea in motion. LaPier, who also has an undergraduate degree in physics, got involved because of the presidential election and what she saw as an assault on science, especially in how it impacted tribal communities – with Standing Rock as a prime example. Jenny Kurzweil, the director of communication and marketing for the Society for Advancement of Chicanos/Hispanics and Native Americans in Science (SACNAS) says the declaration is essential to the future of science. On Earth Day in 2017, an estimated 100,000 people, including LaPier, gathered in Washington, D.C., for the March for Science, while more than a million in 600 cities and towns worldwide held satellite events. In the following months, the March for Science has organized into a nonprofit and started a new initiative called Vote for Science, which aims to keep science central to policy making. LaPier reminded the audience that Native Americans did not become citizens until 1924, and they were not given rights to religion and language until 1978 and 1990, respectively. LaPier is part of a movement that is impacting science and the humanities, in both the academic and activist realms. Importantly, it’s empowering groups of people who have long been excluded from the table to be able to speak their truth – and in that sense, carry on the hard-earned knowledge and practice passed down through generations. 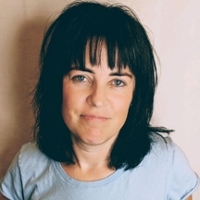 Erika Fredrickson is a freelance journalist based in Missoula. She graduated from UM’s Creative Writing Program in 1999 and earned a master’s degree in environmental studies in 2009.